West Coast Oktoberfest will feature traditional German music, booths serving up Bavarian pretzels and bratwursts, themed contests and plenty of beer to go around, with the added option to purchase a German beer stein to take home. As an extra perk, Music Box is showing the Khabib vs McGregor fight on Saturday, October 6th! Click “Buy Tickets” to purchase a VIP Experience ticket that includes the fight viewing party or you can purchase entry to the fight party on its own for $20! 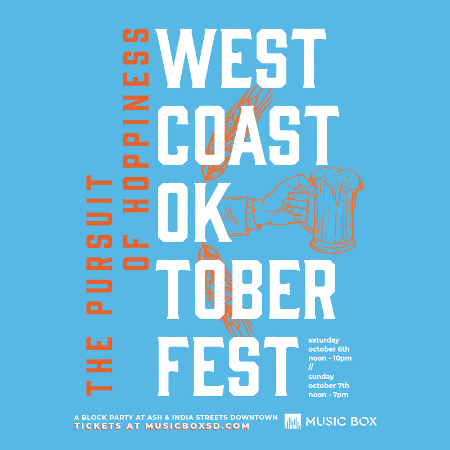 If you are a VIP ticket holder, entry into West Coast Oktoberfest and Music Box begins at 12pm. For UFC 229 Only ticket holders, entry into Music Box begins at 5pm and does not include entrance into the Beer Fest. West Coast Oktoberfest is a 21+ event. Featuring contests, designated pet friendly area, traditional German music, food court, beer vendors and beer steins. The event will span a The event will span a 55,000 sq. ft. block of India Street between Ash Street and A Street. A general admission ticket will get you into the festival but not inside of Music Box.